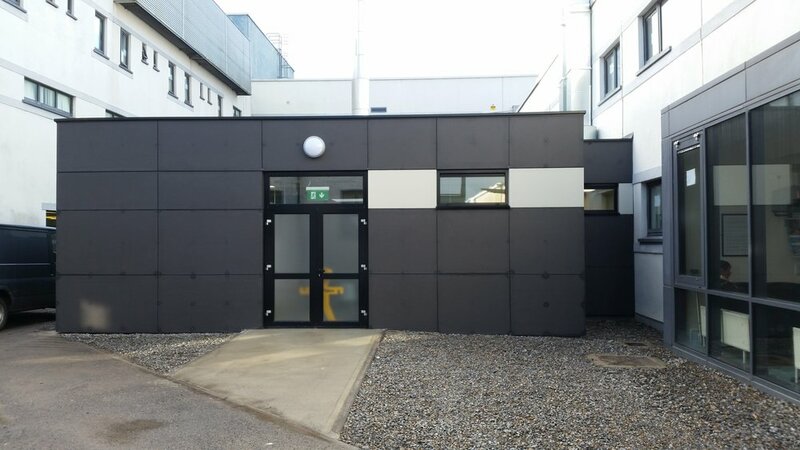 This project involved the design, supply, installation and commissioning of a single storey 6 bed extension, complete with necessary ancillary services, located in the South Tipperary General Hospital Grounds. The works included new drainage and some hard landscaping. The new facility provides 6 no. fully equipped Emergency Department bed spaces, a nurse’s station and a WC. The main entrance to the building is via the existing Emergency Department, and the extension is linked to the existing hospital through 2 no. openings, formed by removing two existing windows in the existing external wall. The new extension is bright and airy with a large roof light in the circulation area. All medical and electrical services are extensions of the existing Emergency Department services. Mechanical services included the installation of a new AHU onto the roof of the existing hospital; this provides the heating in the new area and future extensions. The building is arranged in a simple open plan layout; the link connects the extension to an existing corridor and the new nurses station is situated adjacent to the existing nurse’s station, to ensure ease of administration. An emergency exit door provides an alternative means of escape for the entire department. The exterior of the building is clad with Tegral rain screen, in a colour that complements the existing metal panels. They are fixed using a batten and counter batten system, to the external walls of the building modules. The main plant (AHU) is located at roof level and served via the existing plant room roof exit door. The building is designed to meet relevant regulations and the requirements for robustness of the structures as per client’s brief.